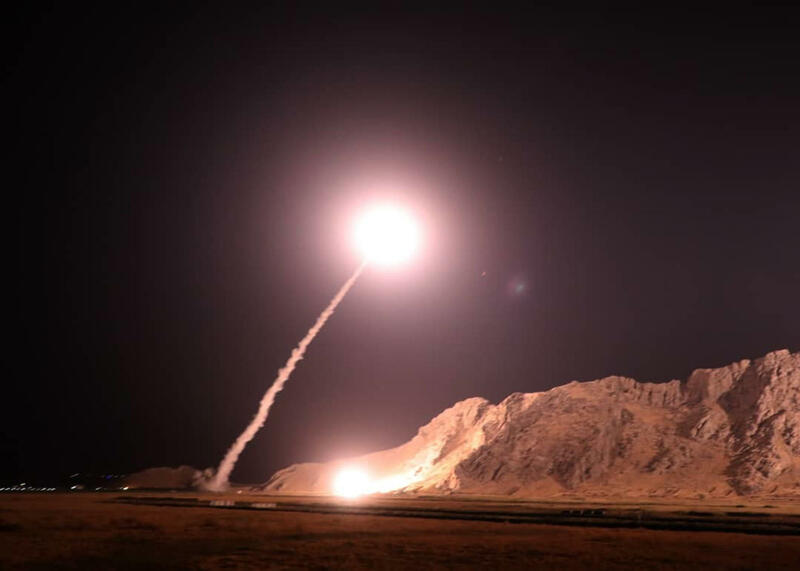 TEHRAN, Iran -- Iran's paramilitary Revolutionary Guard said Monday it launched ballistic missiles into eastern Syria, targeting militants the force has blamed for a recent attack on a military parade in Iran. The launch was the Islamic Republic's second such missile attack on Syria in over a year. A prominent Syrian war monitor said the missiles struck a town held by the Islamic State of Iraq and Syria (ISIS), one of the few remaining pockets of land in Syria still in ISIS' hands. Iranian state television and the state-run IRNA news agency said the missiles "killed and wounded" militants in Syria, without elaborating. Syrian state media did not immediately acknowledge the strike. Iranian TV showed video of one of its reporters standing by as one of the missiles was launched, identifying the area as being in Iran's western province of Kermanshah. A state TV-aired graphic suggested the missiles flew over central Iraq near the city of Tikrit before landing near the city of Boukamal in the far southeast of Syria. Boukamal is held by forces loyal to Syria's embattled President Bashar Assad. However, the city has been targeted even now by ISIS militants who have lost almost all the territory they once held in both Syria and Iraq. Rami Abdurrahman, who heads the Britain-based Syrian Observatory for Human Rights, told The Associated Press the Iranian missiles hit the ISIS-held town of Hajin, just north of Boukamal. Strong explosions shook the area in the early hours of Monday, reverberating east of the Euphrates River, he said. The area of Hajin and ISIS militants there have been under attack for weeks by U.S.-backed Kurdish-led fighters. One missile shown on Iranian state television bore the slogans "Death to America, Death to Israel, Death to Al Saud," referring to Saudi Arabia's ruling family. The missile also bore in Arabic the phrase "kill the friends of Satan," referring to a verse in the Quran on fighting infidels. "This is the roaring of missiles belonging to the Revolutionary Guard of the Islamic Revolution," the state TV's reporter said as the missiles launched behind him. "In a few minutes, the world of arrogance -- especially America, the Zionist regime and the Al Saud -- will hear the sound of Iran's repeated blows." The semi-official Fars news agency, believed to be close to the Guard, identified the six missiles used as Zolfaghar and Qiam variants, which have ranges of 465 miles and 500 miles respectively. Analyst Hadi Seyed Afghahi, who is close to Iran's establishment and the Guard, said he believes the missiles were launched in coordination with the Syrian government. A Syria-based official with the so-called "Axis of Resistance" led by Iran, which includes Iran, Syria, the Lebanese militant Hezbollah and other groups fighting alongside Assad's forces said the missiles hit "the last pocket held by Daesh" in Syria, using an Arabic term to refer to ISIS. The official spoke to the AP via text messages from Syria on condition of anonymity because he was not authorized to talk to the media. The missile launch further adds to confusion over who carried out the assault on a military parade in the Iranian city of Ahvaz on Sept. 22 that killed at least 24 people and wounded over 60. ISIS also claimed responsibility for the assault, but initially made factually incorrect claims about it. Later, ISIS released footage of several men that Iran ultimately identified as attackers, though the men in the footage never pledged allegiance to the extremist group. In announcing the attack, Iranian state media said the missiles targeted both "takfiri" militants -- a term it often applies to ISIS -- and Ahvazi separatists. The separatists have not been known to work with ISIS in the past. In Monday's statement, the Guard said that, based on evidence from the Ahvaz attack, the "terrorists" in eastern Syria are supported and guided by the United States in line with "satanic" plans of the White House, the Zionist regime -- Iranian parlance for Israel -- and a regional power, a reference to Saudi Arabia. The statement added that the Guard's "iron fist" remains prepared for any further steps by Iran's enemies. Last year, Iran fired ballistic missiles into Syria over a bloody ISIS attack on Tehran targeting parliament and the shrine of Ayatollah Ruhollah Khomeini. In September, Iran fired missiles into Iraq targeting a base of an Iranian Kurdish separatist group. The separatists say that strike killed at least 11 people and wounded 50.